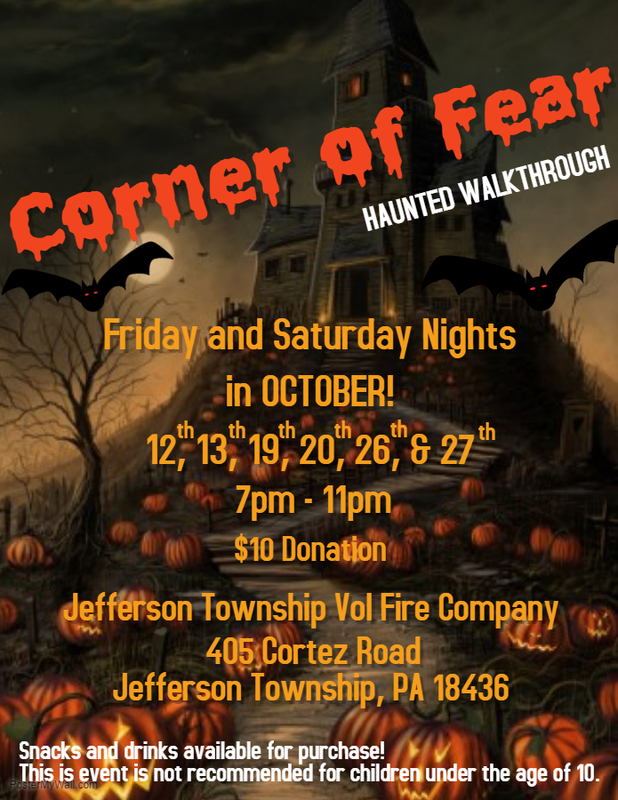 Join us for our Halloween themed fundraiser, The Corner of Fear, Haunted Walkthrough. This event will be held outside on Friday & Saturday Evenings in October (Oct 12, 13, 19, 20, 26, 27) from 7pm to 11pm. This event will be held outside, on our company grounds. Parents dropping children off for the event, are welcome to wait in our general area. There is food and a bonfire available during your wait. We do not offer discounts or group rates. Porta-johns are located on the premises. Ticket booth opens at 7:00pm. Ticket booth closes promptly at 10:30pm. The event is 96.764% covered, we will be open, regardless of rain. Please wear appropriate clothing, you will be outside and exposed to the outdoor elements, so expect a little dirt. This event is not recommended for children under the age of 10. This event is not recommended for customers that are pregnant, have heart or lung conditions or are in general poor health. Strobe lights and fog machines are utilized. Anyone caught damaging, stealing or tampering with any equipment will be removed and subject to prosecution. Violence against our volunteers will not be tolerated. Anyone found assaulting or injuring a volunteer will be immediately removed and subject to prosecution.